Healthy eating experiences in Geography! In Geography, some of our home-schooled children have been exploring a Land and Water Map of Arizona. They have discussed that Arizona has deserts and these deserts are hot and dry. They are also sandy and rocky. Arizona has a large canyon which is a deep valley that has steep sides. 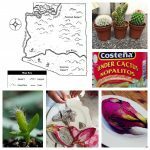 To help them understand the concept further, tutors have included a food tasting activity which included tasting different types of food eaten in Arizona such as the Pitaya/Pitahaya (the fruit of several different cactus species) and the Dragon Fruit. This activity has also helped children engage in healthy eating experiences, teach them to recognise different foods and encourage them to experiment with new foods, tastes, flavours and textures while having fun at the same time!